While most of the NBA world was focused on big name trades and flashy signings, Brook Lopez quietly signed a one-year contract with the Milwaukee Bucks. For many NBA fans, the move barely registered, but could wind up being one of the most impactful of the summer. Lopez fell off the radar a bit with the Los Angeles Lakers last season, hitting career-lows in minutes and points per game. However, he was still a solid net positive for the Lakers at both ends of the floor and the massive 3-point shooting experiment he undertook the year before with the Nets mostly held. Over the first eight seasons of his career, Lopez attempted only 31 3-pointers, making just three. Over the past two seasons, he has made 34.6 percent of 712 attempts. Lopez used to be primarily a low-post scorer but expanding the range on his jumpshot has added to his game and made him much more useful in a supporting role, like the one he’ll play for the Bucks. Nineteen teams had their centers (as classified by NBA.com) attempt at least 100 3-pointers last season. Of that group, you can see the Bucks were on the bottom in both frequency and accuracy. 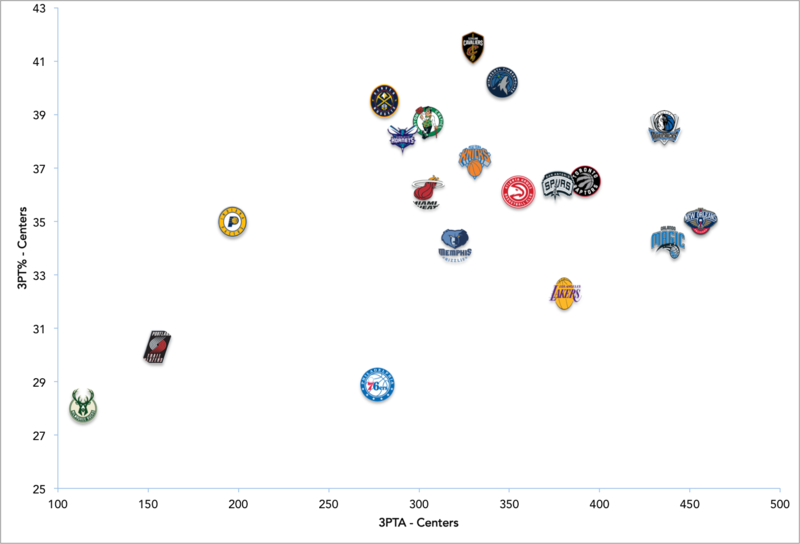 Obviously, having your center shoot 3-pointers is not a prerequisite for an elite offense -- neither the Houston Rockets nor Golden State Warriors appear on that chart because both teams use their centers almost exclusively as rim-runners rather than floor spacers. However, the difference between those teams and the Bucks is that they have primary ball-handlers -- Kevin Durant, Stephen Curry, James Harden, Chris Paul -- who are exceptional off-the-dribble shooters and pull defenders away from the center of the floor. That’s just not true for Giannis Antetokounmpo. Antetokounmpo was incredibly effective off the dribble last season, one of just nine players in the league to shoot at least 50 percent on drives while averaging double-digit drives per game. But it’s not because he was taking advantage of a well-spaced floor or because the defense was forced to over-extend to guard him on the perimeter. It’s simply that he’s a skilled finisher who was able to maintain efficiency despite an incredibly high degree of difficulty. The Bucks have had some terrific outside shooters on the roster, but they have never been able to surround Antetokounmpo with four 3-point threats at one time, an arrangement that presents the largest possible conundrum for a defense. By adding Lopez to the roster, that won’t be a problem this season. Lopez attempted more 3-pointers last season than 20 teams got from their entire center rotations. He’s not quite an elite shooter by accuracy but he’s reliable and prolific enough to hold a defense’s attention. In addition, new Bucks head coach Mike Budenholzer has already demonstrated his facility at leveraging a stretchy center into offensive advantages. He was the coach when Al Horford expanded his range -- going from 36 3-point attempts in 2014-15 to 256 in 2015-16. Budenholzer’s use of the rangy Pero Antic at center in a 2014 first-round playoff series against the Pacers helped pull the then-dominant Roy Hibbert away from the paint and pushed Indiana to the brink. There has been plenty of excitement about what Budenholzer can do for Antetokounmpo and the Bucks, and Lopez should be a huge piece of their offensive evolution this season. He’s one of the few legitimate stretch-5s in the league and his shooting can help open the floor for Antetokounmpo to continue taking those giant strides towards super stardom.